Red Velvet is one of my all time favorite cake flavors, specially around Valentine’s Day. So this year I wanted to make a yummy dessert for my family using Red Velvet cake mix. I dug into my pantry and came up with what turned out to be the best Red Velvet cupcake ever! So we have a concoction made of Red Velvet cake mix and Fudgy Chocolate cake mix. Topped with Cream Cheese icing, drizzled with some almond bark and topped with a cherry. These cupcakes were out of our house in 2 days flat! This would make a really decadent treat for after your Valentine’s Day dinner! 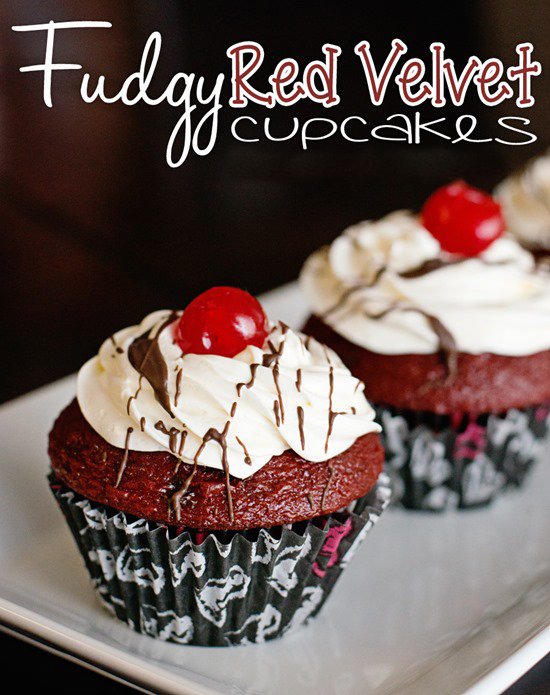 Seriously, if you like Red Velvet you must try these. In two separate bowls, prepare each cake mix as directed on the box. Line your cupcake pans with cupcake liners, will make 48 cupcakes. Fill your cupcake liners 1/4 of the way with the fudgy chocolate cake mix, then finishing filling them with the red velvet cake mix until 2/3 full. Bake in the oven, as directed on the cake mix box. Frost with cream cheese frosting, set aside. Melt your almond bark, as directed on the package, and with a fork you can drizzle the almond bark across the top of your cupcakes. From experience, more is better! Top each cupcake with a cherry. We used Duncan Hines cake mix for both boxes and baked them in the oven for 19 minutes. We also used the Duncan Hines cream cheese frosting. The packages that we purchased were safe for nut allergies, however; please please please read the labels as manufacturing can change over night. Ham, Egg and Cheese Monkey Bread – Make Ahead, Heat & Eat!